Gulf Winds Track Club's Summer Trail Series opened south of Tallahassee, Florida on Saturday morning, 10 June 2017, with the six mile Munson Hills Trail Race. 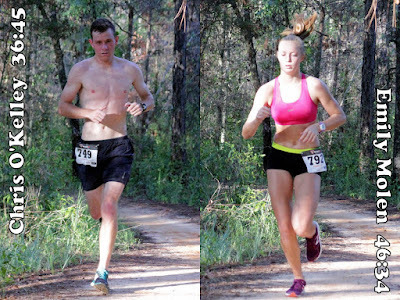 There, Chris O'Kelley and Emily Molen opened the four-race Series with wins. O'Kelley was the overall champ of the six-mile race, finishing 250 meters ahead of the next runner in 36:45. Emily Molen was the first woman in the race, placing tenth overall in 46:34. Chris O'Kelley and Emily Molen. Photos by Fred Deckert. During the first four year of the Summer Trail Series, 2013 to 2016, all of the races on the circuit were either at Tom Brown Park or in Phipps Park. 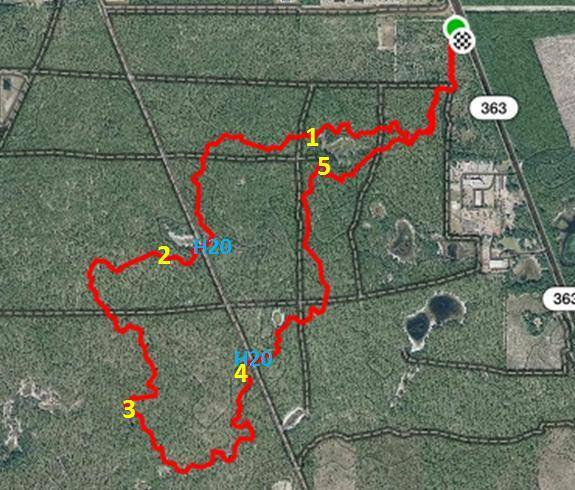 After sixteen runs divided between those two venues, the Munson Hills race broke new ground. Billed at six miles, it was the longest race in the history of Series. Additionally, it was Chris O'Kelley's debut on the circuit. Which isn't to say that O'Kelley was a neophyte. Just a month earlier, he had won the Tails & Trails 10K, running 38:54 on the paths of Tom Brown Park and the Lafayette Heritage Trail. During the autumn of 2016 O'Kelley had posted a posted a 36:23 win at the Run For Lawson 10K, 6.2 miles of tough cross-country running. 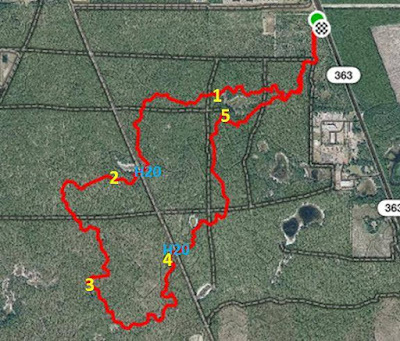 If you were going through the resumes of the Munson Hills entries, looking for an athlete qualified to race six miles on trails, you'd pick O'Kelley. The Lincoln High alumnus lived up to his record, winning in 36:45. Ryan Slyter was second in 37:45 and Charles Biberg third in 39:19. Gary Johnston was the fastest master runner in the race, placing fourth overall in 44:18. It was the debut in the Summer Trail Series for O'Kelley, but not for Emily Molen. Three years earlier as a Deerlake Middle School cross-country runner, Molen had been the first female finisher in two of the Series races in 2014. The Munson Hills race was Molen's first run on the circuit since those wins, and it was quite a return. Now a rising sophomore on the Chiles High cross-country team, Molen won the women’s division in 46:34, placing tenth overall. Monica Judd was the first woman master and second female finisher, placing seventeenth overall in 49:05. Nazarae Rodriguez was third in the women's standings and 23rd overall in 50:02. 87 athletes finished the Munson Hills Trail Race. Gulf Winds Track Club timed the run. The 2017 Summer Trail Series continues with a four-and-a-half-mile race at Phipps Park on Saturday morning, 1 July 2017; a five-mile race at Phipps Park on Saturday morning, 15 July 2017; and concludes with a four-and-a-half-mile race at Tom Brown Park on Saturday evening, 5 August 2017.